Are you a home owner looking for pool or pool equipment service or installation? Pool Supplies Canada has you covered - we are proud to offer our Canadian customers one of the largest Canadian technician service network lists online! Having pool problems? Need some information on how to open your pool, or how to prepare it for the Winter season? Pool Supplies Canada is proud to offer a variety of helpful, step by step pool care and maintenance guides through our website to assist our customers with all of their pool needs. We offer the lowest prices on Pool and Spa Supplies in Canada. Our large volume purchasing power is passed along to our Canadian customers, and ensures you are paying the lowest prices in Canadian dollars. Browse all of the best brands at the lowest prices from manufacturers such as Hayward, Zodiac, Pentair, Jandy, Polaris, Swimline, GLI, Carvin, Dolphin, HotSprings, Aqualeader, Lawrason’s, Capo, Natural Chemistry, SR Smith, Interfab, Pleatco, Feherguard, Raypak, SeaKlear, Toile Soleil, Atlantic Pool Products and many more. Have confidence knowing that our pool and spa products come backed with Canadian manufacturer warranties and all products sold are certified and warrantied for use in Canada. 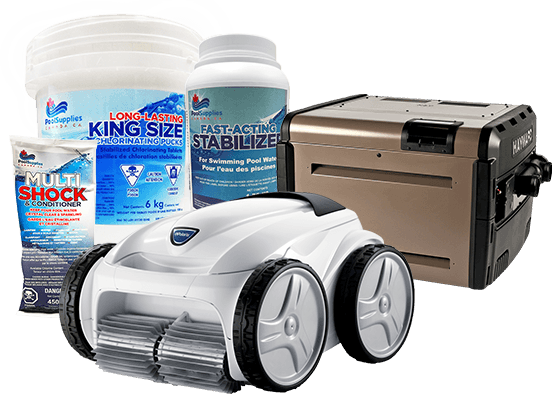 Additionally, select products we carry have exclusive extended warranties, only available through Pool Supplies Canada! Being Canadian ourselves, we recognize the importance of only offering products that can withstand the harsh Canadian Winters.